As the guy with the least going on outside of freelance adventuring, Byron was already defining himself as a good vehicle for our ideas about adventuring as a metaphor for the struggles of the middle class. But our lingering ideas about his being a little crazy meant that he sabotaged himself a bit as a freelancer, which isn’t quite the same as doing everything right and still having the system screw you. On the one hand, good on him for figuring out how to derive multiple income streams from a single job. On the other hand, Byron, you really should negotiate your rates up front, and you really, REALLY should do some negotiation or maybe even just count the money before you shout your catchphrase and call it a day. Byron the Berserker’s catchphrase is derived from Bob the Builder, but neither Phil nor I was interested enough in that series to follow up on that connection. Back in the good ol’ days “a pouch of monies” was the universally accepted rate for any one middle class job. The aristocracy dealt in chest sized amounts. I’m a bit surprised though that these agrarians have that kind of money. For a typical DnD peasant that would’ve been their life savings probably. … The implication being they’re giving up their life savings with alacrity to forestall it being taken from their cold, dead hands. For all the cynicism this comic sometimes indulged in, it never really followed up on that. So, Sepia!Byron was originally a pothead. (I assume the withdrawal was because he was in the tank, and he wasn’t able to get a fix?) Is that still the case in your heads? The ending made it seem like the 5 died as soon as the experiment began, at least in our world. The tank’s real function was to slow their decay and keep them from stinking up the basement. Sepia Byron’s chemical cravings wouldn’t have crossed over, just his soul, whatever that is. I think you should go more in the commentary into your ideas about adventuring as a metaphor for the struggles of the middle class, because it gets overshadowed by the whole race war allegory. Ardaic = Bill Lumbergh? I never did get why these guys were so scared of him doing…well what they wanted him to do. I didn’t see anything he did that warranted them fearing he was going to go after them next. BTW, I don’t know why you decided to post these daily, but thank you! There’s some very nice watercolor work going on in the backgrounds here. And I also am interested in “adventuring as a metaphor for the struggles of the middle class.” I get the “gig economy aspect, and also the “role of the dice” aspect, and even the “secretly controlled by corporate big shots who couldn’t care less” aspect, but the whole house-and-car-and-offspring thing seems a bit lacking. No my man. Every single quest I do in every single game? I don’t negotiate, I don’t count. I am a hero, therefore I am a tool. If I’m lucky I save a whole village and three burning orphanages and get like 10 rep. What in the hell. 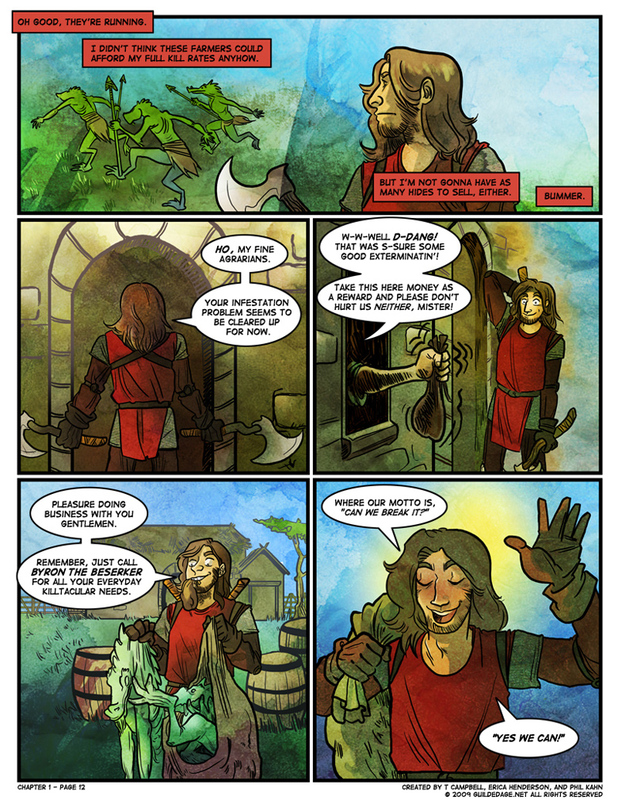 Is no-one else going to remark on the oddity of handling Kobolds as farmable sources of combat XP in a comic where the overall message is that Orcs Are People Too? Several people commented on that on the earlier pages!